The spectacular new Homewood Suites Long Island-Melville hilltop location site provides panoramic views of our central location adjacent to the Long Island Expressway (I-495) and the heart of Long Island's major business community. This upscale hotel is designed to fulfill the needs of both the business and leisure traveler. From design to inception, no detail has been overlooked in order to provide a quietly elegant atmosphere with all the facilities and amenities one could imagine. In addition to our 76 studio suites, there are 48 suites with one bedroom and 23 with two. All have sofa beds. 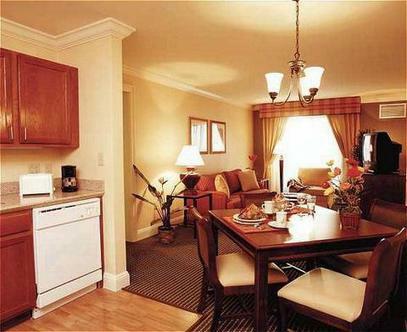 They all have a fully-equipped kitchen with refrigerator, two-burner stovetop, microwave, dishwasher and coffee maker. All suites also feature a spacious work desk, two dual line phones with voice mail and data ports and complimentary High-Speed Internet Access. The high quality that is evident throughout this stunning new hotel is enhanced by the value that the Homewood Suites name has come to represent. The daily hot breakfast, Welcome Home Reception (Monday-Thursday), local calls, indoor pool, whirlpool, Exercise Room, and Business Center are all available at no extra charge. A variety of sundries, snacks and microwaveable food items are available in our 24-hour Suite Shop and, of course, you'll find a guest laundry. Small meetings are easily arranged in either the meeting room (which accommodate groups up to 50) or our Executive Boardroom which seats ten in luxurious comfort. Quality, value and attentive service from a well-trained staff of hospitality professionals await the business traveler, travelers with families, or anyone who requires an extended stay. As much as you hate to leave your home you'll coming to ours.